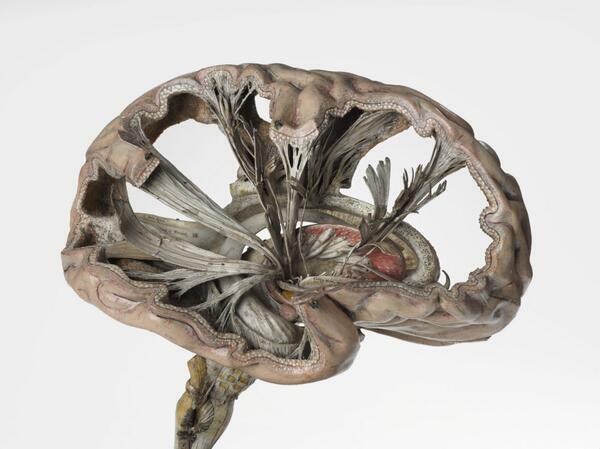 Left image: As part of its 2014 exhibition entitled Mind Maps: Stories from Psychology, the London Science Museum showcased this very accurate and intricate papier-mâché brain model from 1900 that shows path of nerve fibers. French physician Louis Thomas Jerôme Auzoux developed this technique around 1820 due to the shortage of human cadavers and wax models to study human anatomy. He was inspired by papier-mâché dolls that were common at the time. His models became popular in schools, universities and hospitals, and many of them could be taken apart for educational purposes (right image). Tweet from the London Science Museum (2014). Also see their exhibition page (now closed). Discover Magazine. Papier-Mâché Brain (1801-1850). Wikipedia page on Louis Thomas Jérôme Auzoux. Céline Poirier's pinterest page on Auzoux. 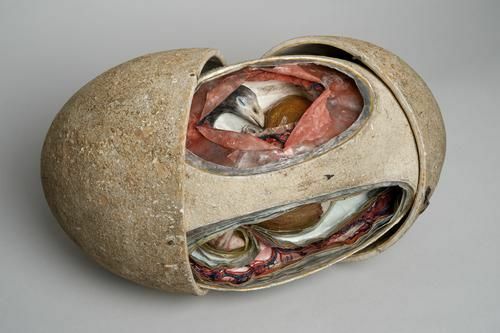 Anatomical Models: Praiseworthy Precursors of Plastinated Specimens. J Int Soc Plastination Vol 15, No 1: 30-35, 2000. Danica Marković and Bojana Marković. Development of Anatomical Models – Chronology. Acta Medica Medianae 2010, Vol.49(2).